Morning Journal/Jo Ann Bobby-Gilbert East Liverpool’s newest firefighters were sworn in Friday by Municipal Court Judge Melissa Byers Emmerling. Shown with Chief Bill Jones are firefighters (from left): Jordan Gibbs, Shawn Fiffick, Joshua Coil and Travis Bricker. 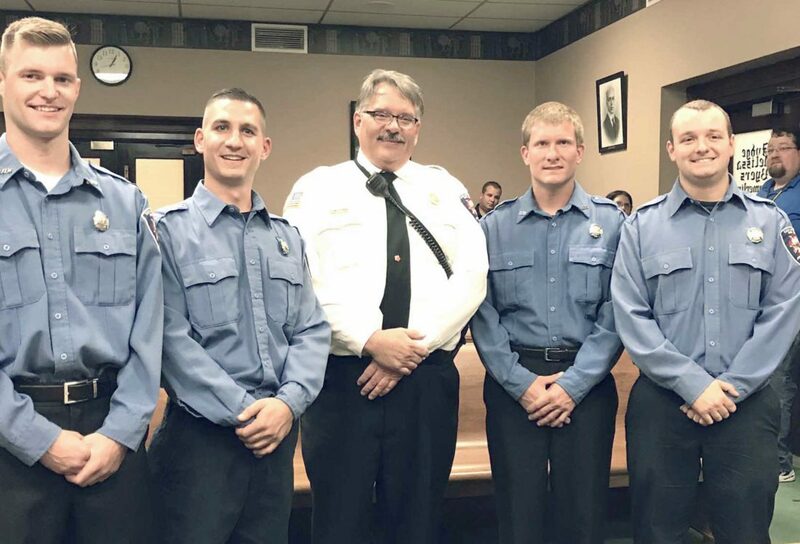 EAST LIVERPOOL — The city fire department gained four new firefighters Friday after were sworn in by Municipal Court Judge Melissa Byers Emmerling. 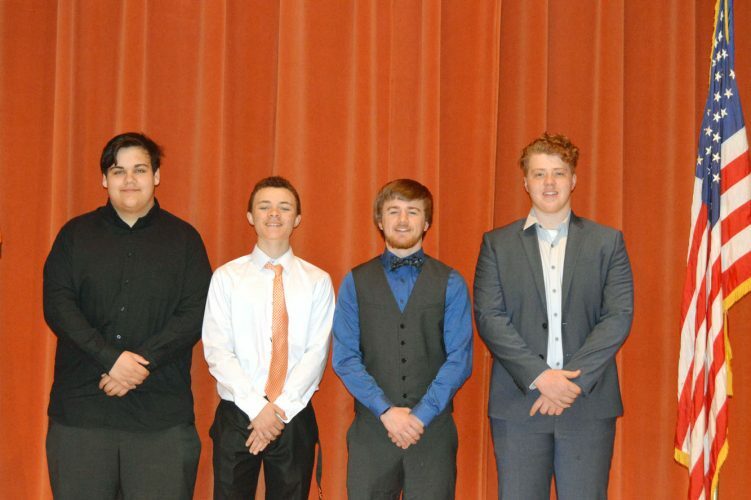 Joining the ranks were Travis Bricker, Joshua Coil, Shawn Fiffick and Jordan Gibbs, who passed a recent Civil Service test as well as an agility test given at Central Station. Bricker, from Hanoverton, is a United Local High School graduate and completed his fire training at the Columbiana County Career and Technical Center. He served five years as a firefighter with Hanoverton Volunteer Fire Department and also is a part-time firefighter with Canfield and Newton Falls fire departments. 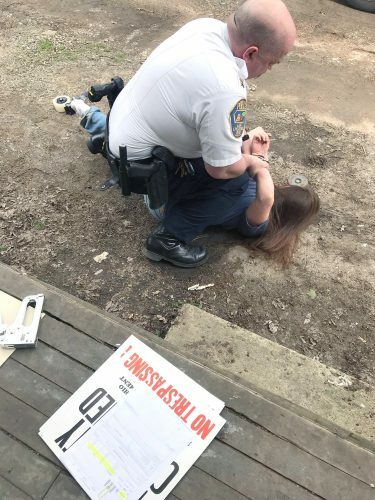 Bricker’s fiance, Hannah Raymond, pinned on his badge. An East Liverpool resident and high school graduate, Coil has not yet undergone any fire or EMT training nor has he any firefighting experience. Chief Bill Jones said he will first take his EMT training at the Mahoning County Career and Technical Center, a four-month course beginning in October, then will begin fire training, most likely at the Youngstown Fire Academy. Coil’s mother, Michelle Coil, pinned her son’s badge on after he was sworn in, with his friend Heather Sell by his side. Fiffick is from Boardman and a Boardman High School graduate. He completed fire training at the Youngstown Fire Academy and has been a part-time firefighter for six years at the Canfield Fire Department. His father, Dave Fiffick, pinned on his badge. A North Jackson resident, Gibbs graduated from Western Reserve High School and completed fire training at the Mahoning County Career and Technical Center. He was a firefighter at Ellsworth Volunteer Fire Department for five years and three months as a paid part-time fireman at the Girard Fire Department. Gibbs’ father Tim Gibbs pinned on his son’s badge. Coil, Bricker and Gibbs were hired primarily to serve as EMTs on the city’s new co-op ambulance operated through the fire department, with Jones emphasizing each also will be available for call out as firefighters when needed. The new hires will begin their duties immediately, even Coil, who will become acclimated while he undergoes his EMT training. While taking his fire training, he will concentrate on that, with the other firefighters rotated to fill his position until he completes the training, Jones said. All four of the new firefighters will be required to move into the city school district as part of their hiring requirements, according to Jones. This hiring brings the department to 16, including the chief, and Jones said his initial goal was to hire one additional firefighter, but by working with the city administration and council, he has been able to hire 14 of 16 who have passed recent Civil Service tests. “This round, we had six candidates, and I would have hired all six. It was a tough decision,” Jones said. He said the young firefighters are “full of vim and vigor,” saying, “They want to learn,” and saying having a full crew not only makes it easier on the firefighters when battling a blaze, it adds to their safety knowing they have adequate back-up. The swearing in ceremony was attended by most of the current fire crew, city officials and a host of the new firefighters’ family and friends.